pH neutral formula that is safe to use on paint, wheels, glass, aluminum, chrome, etc. CarPro TRIX Tar and Iron Remover is a pH neutral formula designed to help safely remove Tar and Iron deposits on your vehicle's exterior in one step! 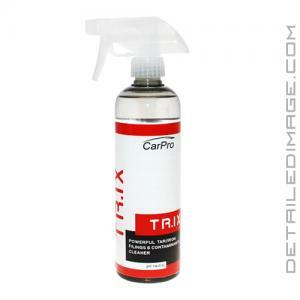 TRIX combines the popular CarPro Iron X and CarPro Tar X products into one easy to use degreasing solution. Again it is pH neutral so it is safe to use on the paint and many other surfaces like the wheels, glass, most plastic trim, aluminum, and chrome. Avoid working in direct sun, do not let it dry on plastic trim and avoid spraying it on headlights and clear bras. Simply mist it on the affected areas and it will instantly start to break down those particles at the molecular level, let it dwell for just 2 - 5 minutes maximum and simply rinse it off. Retreat any extra stubborn build ups and agitate them lightly if necessary. Upon completion your vehicle's exterior will look and feel clean so you can move on to the next step with confidence knowing your paint is free of contaminants. If you are looking for one product that is highly effective yet still gentle then pick yourself up the CarPro TRIX Tar and Iron Remover. Spray on, wait 5~7min. while contaminants change color. Agitate with damp soft sponge or detailing brush. Avoid drying under direct sun ! Great product to use before the clay bar process to remove iron & tar contaminants, also great to prep wheels before detailing! I used it today, because they were paving a street and tar got on my Mercedes. If there is something I hate the most is tar. Thank God I had purchased Trix. This stuff is great. I can see the tar running a bit and it turns purple which is kinda cool. Has a strong smell like citrus on steroids and radiation. After a bit of rubbing I got all the tar out. I will be purchasing gallons of Trix in the very, very near future. I hope this is helpful. Great stuff to prep the paint prior to paint correction, worked great with less smell than ironX. Will be purchasing more shortly and worked great on all surfaces and paints.